$50.00 Application Fee. $150.00 Admin Fee. Monthly W/S/T charge: $73.00 in addition to rent. Carpet throughout. Galley style kitchen with white cabinets, white appliances including dishwasher. Huge master bedroom. Large bathroom with large vanity. 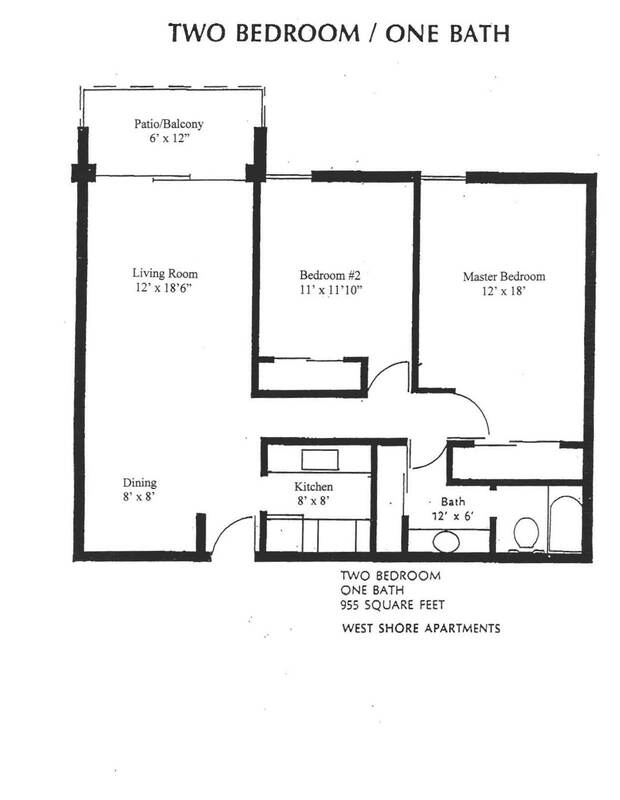 Floor Plan square footage, layouts, and measurements listed on this page are an approximation for illustrative purposes only. Floor Plans are subject to vary between individual homes and should be viewed to determine the suitability for space requirements. Rental rates, deposits, availability, and specials are subject to change without notice. Rental rates and deposits may also fluctuate based on features, locations, lease terms, credit and rental history, income, and other qualifying standards. Occupancy guidelines will apply. Again, the information listed on this page is to be used as a point of reference and is not a binding agreement. Deposits listed are minimum deposits required. Amount of deposit is based on applicants credit, employment, criminal and rental history. Deposit may be as much as one months rent or possibly more. Co-signer may be required. Income requirement:applicant must have a gross monthly income equal or greater than three times the monthly rent. Westshore Apartments: 4601 W. Gray St.
Embassy Apartments: 302 N. Hubert Ave.